Have you taken our “What Diamond Shape Are You?” quiz yet? If not, you should go take it, share your results, and come back. With that in mind, I decided to do a roundup of our celebrity engagement rings that feature a pear center diamond. I was a little pleasantly surprised to discover that there are definitely certain similarities between these women. 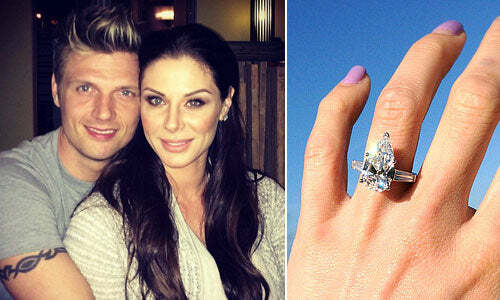 Lauren Kitt — Her engagement ring, given to her by Nick Carter of the Backstreet Boys, features 7 carats with a center pear diamonds and two tapered baguettes. Avril Lavigne — This huge 14 carat engagement ring features a center 10 ct. pear shaped diamond and two 2 ct. half moons on each side. 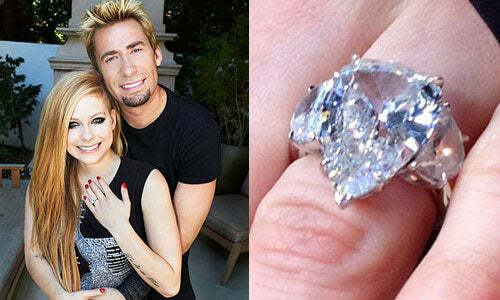 Lavigne’s now husband Chad Kroeger recently topped this with a 17 carat emerald cut anniversary ring. Holly Valance — This Australian actress and singer wears a large pear diamond, reportedly 8 carats, with a simple diamond band, given to her by billionaire Nick Candy. Bethenny Frankel — Her 6.5 carat pear shaped diamond engagement ring originally featured two trillion cut diamonds (as pictured). For her 41st birthday, the diamond was reset into a more modern halo setting, very similar to Katherine Heigl’s ring below. Katherine Heigl — Her engagement ring is a reported 3 carats and features a diamond halo around the center stone, as well as recycled platinum from her mother’s engagement ring. Jessica Simpson — Her first engagement ring from Nick Lachey featured three pear diamonds in a classic three stone configuration (pictured). Her second engagement ring from Eric Johnson is similar in that it also has two pear shaped diamonds on the sides, but the center stone is cushion or oval shaped 5-plus carat ruby, which is her birthstone. Here at deBebians, we can make any of these pear settings for you. Three stone settings can be found here, and halo settings can be found here. We can also custom design and manufacture a beautiful pear shaped diamond setting for you.